I assure you, this had nothing to do with how explodey and awesome The Fate of the Furious was. No way at all. The Fate of the Furious, at the time of this writing, has grossed $532.5 million during its first weekend at the worldwide box office, according to Deadline. Domestically, it made $100.2 million. In fact, Fate even surpassed Star Wars: The Force Awakens’ worldwide opening weekend record of $529 million, Deadline reports. If you had hope that they were going to stop making these things after the eighth movie, then you can consider those hopes dashed. 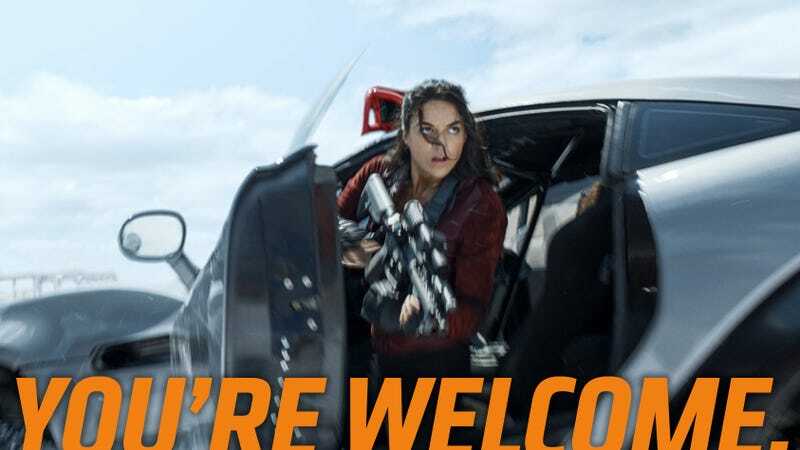 The film has already grossed half a billion dollars because we, Fast and Furious superfans, hyped the living daylight out of this movie from the start, which in turn got you guys all excited and you just had to see the movie so it could answer all of your burning and profound questions. We first learned there would be a trailer. We first learned the name of the new film. We were astounded that Dom was the bad guy in the first trailer. We wondered what the big mystery was in the second trailer. Were thought the movie looked like a nightmare for car hacking. We praised its cinematic quality when it finally did come out. And we didn’t even get to hang out with The Rock! Man, I hope this movie wins an Oscar. It definitely deserves it.